Windows are an architectural necessity for any building. A scenic view is the want and desire of every building owner, property manager, and office worker. Yet windows present concrete problems, especially with respect to the sun. High air-conditioning costs, furniture fade, glare, and tenant discomfort caused by excessive heat, are just some of these problems. 3M window film, first introduced by 3M Company in 1966, addresses these issues by reducing a combination of the sun’s visible light, ultraviolet light, and infrared heat. 3M Window Films are a component of LEED Sustainable Design. Click here to learn more. 3M manufactures multiple lines of sun control films that are suited for commercial applications. 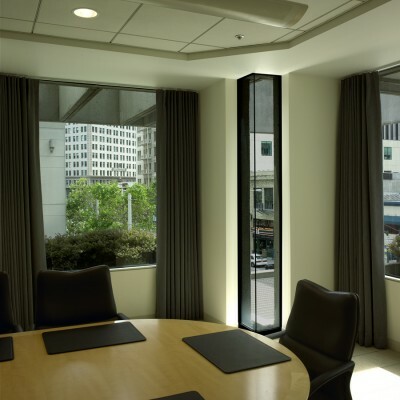 Providing an abundance of natural light in your buildings is a great way to conserve energy. But sunlight can create excessive heat and uncomfortable hot spots, fades valuable furnishings, creates computer screen glare and contains harmful UV rays. Whether your buildings are high-rise or low-rise, 3M™ Sun Control Films help you to control energy costs and provide tenants with a more comfortable environment. 3M Window Tinting can do more than shield you from high energy bills. They can help protect you from unwelcome events like hurricanes, severe storms, accidents and vandalism. The advantages of etched, cut, sandblasted, textured and other decorative glass film designs are clear: Privacy can be customized, while light still pours from room to room, creating an open feel even in confined spaces. Yet, how to achieve these effects and still remain within budget? It’s possible, with 3M™ Fasara™ Glass Finishes and with 3M™ Crystal Finishes. With DI-NOC architectural finishes, the colors, designs, textures and finishes give you almost limitless creative freedom. These architectural finishes faithfully reproduce over 500 different materials such as common and exotic woods, metal, marble, leather, stone, stucco, granite and more.